Suitable for all ages, stimulating and challenging for children and adults alike. 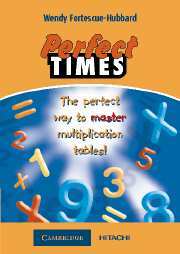 Perfect Times is designed to develop multiplication and division skills as well as recognition of multiples and factors and different types of number sequences - squares, cubes and triangle numbers, and so on. There are four games on the CD-ROM each with a large number of variations. 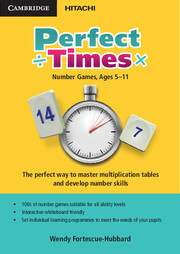 Games vary from basic multiplication and division skills (Times Up) to games which, at their more difficult levels, will challenge even the most able mathematician (Twirling Numbers). Perfect Times can be used across a network so many players can develop their numerical skills simultaneously. Players can monitor their own progress, and the administrator can view that of all players, in a variety of ways. Players can see their own progress and a teacher can see their pupils' results. Extensive teacher support is provided. Fun and motivating games help pupils to improve their knowledge of number facts. Results can be displayed as printable tables so you can easily monitor the progress of whole classes and set targets. Pupils are encouraged to use various mental methods e.g. using patterns or known facts to find answers. Extra challenges are provided in the form of real-world problem-solving worksheets which give relevance to the learning and require pupils to use their mathematical understanding. Extensive Teacher Support related to teaching the times tables is provided. Suitable as a starter activity with the whole class as well as individual use on a PC or Mac.